Jacoby Ellsbury proved that you don’t have to play to make a lot of money. In the offseason after he made $490,000 and played in 18 games, his salary rose to $2.9 million. The number of players on the disabled list is actually down a tad this season, projecting to fewer than the 3,000 games lost that was the norm from 2008-11. According to Major League Baseball’s tracking, there were 183 players on the 15-day disabled list at this date a year ago, compared with 178 now. And there were 21 players on the 60-day disabled list as opposed to 13 now. But you would be hard-pressed to find anyone in baseball - particularly with the Red Sox, Phillies, and Yankees - who takes any solace in that. Whatever the rate of injury, the fact is, players are getting hurt. And when they do, they aren’t coming back very soon. Phillies starter Roy Halladay is a bulldog who never complains, but after his depleted offense again could not support his effort in a game against Washington last week, he said, “There are a lot of guys, including myself, who are trying to carry the weight of the team. You can’t play that way, and I think you’ve seen that. People sometimes blame agents like Scott Boras; there is a perception that he advises his players to make sure they’re 100 percent before they get back on the field. Not exactly bad advice, but not the greatest approach for teams that are paying out millions to players sitting on the sidelines. But the Variteks and Damons are few and far between. The wink-wink explanation is that many players are now off performance-enhancing substances. Players used to take steroids and HGH for quicker recovery. There’s also the money. Jacoby Ellsbury proved that you don’t have to play to make a lot of money. In the offseason after he made $490,000 and played in 18 games, his salary rose to $2.9 million. The disabled list reads like an All-Star team. You have first basemen Ryan Howard and Lance Berkman; second basemen Brian Roberts, Chase Utley, and Freddy Sanchez; shortstops Stephen Drew and Alex Gonzalez; third basemen Evan Longoria and Pablo Sandoval; outfielders Carl Crawford, Matt Kemp, Vernon Wells, Jayson Werth, Franklin Gutierrez, Jason Bay, Brett Gardner, Austin Jackson, and Ellsbury; and catchers Victor Martinez and Chris Ianetta. The pitching staff includes Chris Carpenter, Daniel Hudson, John Lackey, Daisuke Matsuzaka, John Danks, Mike Pelfrey, Brett Anderson, Dustin McGowan, Scott Baker, and Nick Blackburn, with a nice bullpen of Mariano Rivera, Joakim Soria, Ryan Madson, Dave Robertson, Andrew Bailey, Brian Wilson, and Drew Storen. And we’re just skimming the surface. “It’s about doing the best you can until your guys get healthy, and once they get healthy, hold your breath that someone else doesn’t go down,’’ said Phillies manager Charlie Manuel. Two players who have stepped up in Boston because of injuries are Daniel Nava, who was heading toward career minor leaguer status, and Will Middlebrooks, who wasn’t expected in the majors until 2013. How about the one Alfredo Aceves got in replacing Bailey? In St. Louis, Lance Lynn made the rotation because Carpenter was injured. All Lynn has done is go 7-1 with a 2.54 ERA. Minor league journeyman infielder Irving Falu got his opportunity in Kansas City when Chris Getz went down and hit .400 in his first 35 at-bats. Raul Ibanez replaced Gardner nicely for the Yankees. Scott Diamond has given the Twins some hope for their pitching future, getting a chance when Blackburn and Baker were hurt. Steve Lombardozzi has filled in admirably in Washington for injured third baseman Ryan Zimmerman. Yet teams still wait and wait on injured players. In Arizona, Drew, a Boras client, hasn’t played for an eternity. He fractured his ankle last July and remains unable to play. Cleveland’s Grady Sizemore has had one injury after another and may be back sometime in June. Maybe. Teams also can be guilty of stretching out injuries. They are so afraid of backlash from players and agents that they take the most conservative approach. 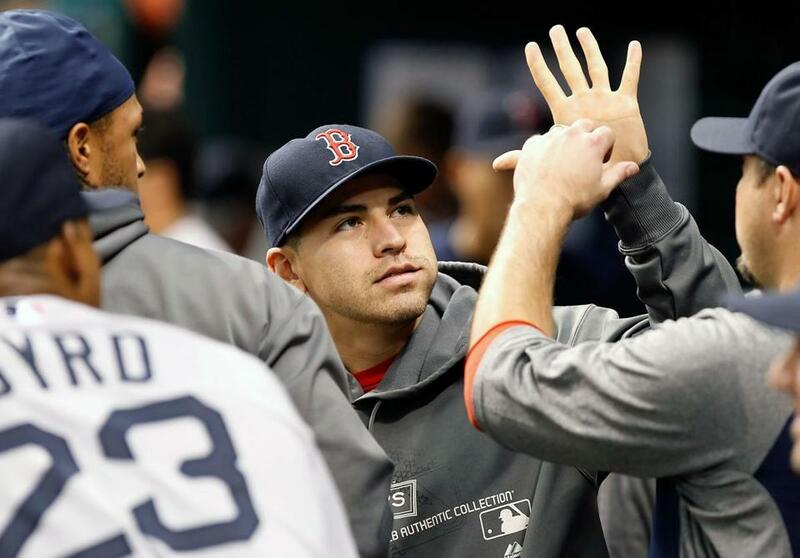 “Some of the rehab schedules are crazy,’’ said an American League manager. “I don’t know what happened to doing as much as you feel you can do. Sums up the Red Sox starting rotation. That notion was confirmed by ESPN’s research department, which determined that Boston has five of the seven slowest-working pitchers in baseball. As of last week, Clay Buchholz was the slowest worker among American League starters, averaging almost 26 seconds between pitches. The slowest seven: Buchholz, 25.8; Jeremy Hellickson; 24.4; Daniel Bard, 24.2; Yu Darvish, 24.0; Jon Lester, 23.8; Felix Doubront, 23.3; and Josh Beckett, 23.2. The league average was 21.2 seconds. One who will never make the list is Aaron Cook. “That’s their style of pitching,’’ said Cook when asked about his teammates. “That’s how they’re effective. For me, when I slow down, I get off a rhythm. I like to work quick, get the hitters in the batter’s box and hopefully get them out quickly. The Red Sox have received a few memos from the league office about picking up the pace. When Buchholz is timed at 33 seconds between pitches, something’s not right. “In Colorado, they tried to get guys to work upbeat,’’ said Cook. “After I watched Greg Maddux all those years and he just threw the ball in the dirt, got the ball back, and started right back with another pitch, that’s the way I wanted to be. “I kind of tell people my attention span is only two hours so I try to get it over with as quickly as possible. I think there’s something to be said for being comfortable and working quick. Working quickly also makes fielders stay sharp. 1. Ben Cherington has not ruled out John Lackey pitching in September. Lackey is coming along well in his rehab from Tommy John surgery. 2. A lot of older players - Hideki Matsui, Vladimir Guerrero, Johnny Damon, etc. - have stayed in baseball. J.D. Drew isn’t one of them. 3. The Red Sox have discussed the possibility of adding another short-season A-ball team. Cherington indicated that there are benefits, particularly if you want a teaching-type team where players can be in a more competitive environment than extended spring training. Currently, the Blue Jays are the only American League team with a third short-season A-ball team. 4. There are people actually happy that Curt Schilling’s Rhode Island-based video game company is dying. Really? How would you like to be one of the 400 people losing their jobs? It’s no laughing matter. 5. Through Wednesday, the Tigers had allowed 16 more stolen bases than they had stolen. The Red Sox were second in the majors in steal differential, with 13 more allowed than stolen. 6. Many of us thought Colorado general manager Dan O’Dowd did a nice job trying to fix the Rockies in the offseason, but so far it just hasn’t worked out. The starting pitching has been horrible. Starters were 8-18 with a 5.55 ERA heading into the weekend. One of the culprits was Jhoulys Chacin, who was 0-3, 7.30, before going on the disabled list May 1. 7. Relievers Aroldis Chapman (Reds), Ryan Cook (A’s), Scott Downs (Angels), Lucas Luetge (Mariners), and Dale Thayer (Padres) started the season with no runs allowed in at least 10 appearances. Chapman had at least one strikeout in each of his first 15 outings. Cook hadn’t allowed a run in 20 games (22 2/3 innings). Downs has converted all three save opportunities since being named closer. Luetge didn’t allow an earned run in his first 17 major league appearances, a Mariners club record. 8. Best-managed bullpens in baseball this year: Buck Showalter with the Orioles and Bobby Valentine with the Red Sox. 1. Roy Oswalt, RHP, free agent - While he was eager to work out for the Red Sox after turning them down before the season, some things haven’t changed. He would still rather play for Texas or St. Louis, according to a major league source. As of last week, the Red Sox had not discussed money with him. They liked what they saw, but the ball is still in Oswalt’s court. 3. Chone Figgins, 3B, Mariners - The Mariners couldn’t pull the trigger on releasing him after Miguel Olivo came off the disabled list last week, but it doesn’t appear that he will be in Seattle much longer. The Mariners have tried to deal Figgins, who has $15 million remaining on his contract. At some point, a team with a lot of injuries might bite if the Mariners pick up some of the freight. 4. Alfonso Soriano, LF, Cubs - Theo Epstein is willing to eat most of Soriano’s $48 million if he can trade him. Trouble is, Soriano is not cooperating. He is hitting only .263 with a .691 OPS. High-priced dumps have to show they’re worth dealing for, because the GM on the other end has to be able to justify picking up an over-the-hill player. Epstein approached the Red Sox about Soriano before the season and while they were discussing Marlon Byrd, but not since. Even with their rash of outfield injuries, the Sox have not bitten, and probably won’t unless there is a disaster around the corner. Soriano is also dealing with some knee pain, which won’t help. 5. Ryan Dempster, RHP, Cubs - On the flip side of Soriano is Dempster. Here is another case where Epstein will eat most of a $14 million salary if he can move him. Dempster is pitching very well. He has a 2.14 ERA in eight starts (albeit an 0-3 record) and a WHIP of 1.061. With his experience, don’t be surprised if Dempster is the next Cubs veteran to go to a contender. 6. Doug Fister, RHP, Tigers - Fister, who starts Monday vs. the Red Sox, is 0-2 with a 1.84 ERA. That is nothing new, as Fister was 3-12 with a 3.33 ERA in Seattle when he was dealt to the Tigers at the trading deadline last season. According to Elias, “His teammates averaged only 2.78 runs per game in Fister’s 59 starts with Seattle - the lowest run support afforded by any American League team to any pitcher who started his career in the so-called ‘live-ball era’ (dating from when Babe Ruth joined the Yankees in 1920) and made at least 50 starts with that team.’’ Hard to believe that a Tigers lineup we thought was so potent has left one of its pitchers parched for run support. 7. Andrew McCutchen, OF, Pirates - We mention him because he is the team’s offense, hitting .331 with 7 homers and 24 RBIs. The Pirates are looking under every rock for offense. Things are so bad that both corner infielders - Casey McGehee at first (.184) and Pedro Alvarez at third (.205) - are around the Mendoza Line. They have virtually nothing at Triple A. Pinch hitters Yamaico Navarro and Nate McLouth were a combined 0 for 22 heading into the weekend. 8. Jed Lowrie, SS, Astros - The Astros are loving Lowrie’s strong start at the plate and steady play in the infield because they can now add him to the list of players available in deals at the trading deadline. Lowrie (7 homers) joins first baseman Carlos Lee (.304), lefty Wandy Rodriguez (2.14 ERA), and closer Brett Myers (12 saves) as Houston players who could be on the move. 9. Alex Gordon, OF, Royals - There’s a feeling that Gordon could be had in a deal, but it would take an overwhelming package, one that includes a front-line starting pitcher. There are a lot of teams out there who need outfielders, and Gordon would be high atop anyone’s list. From the Bill Chuck files: “Ricky Nolasco became the Marlins franchise wins leader when he earned his 69th victory this past week. Since 1993, when the Marlins were founded, the pitcher who has won the most games while playing with just one franchise, like Nolasco, is Tim Wakefield, who won 170 games for Boston.’’ Also, “Through Thursday, Mike Aviles led all major league shortstops with 28 RBIs, and had more than Marco Scutaro (4) and Lowrie (18) combined.’’ . . . Interesting stuff from Stats Inc: Run production is down to 4.21 per team per game through May 24. It has dropped every season since 2006. Also, here is the Don Mattingly influence with the Dodgers: Catcher A.J. Ellis averages a major league-high 4.71 pitches per plate appearance. Toronto’s Rajai Davis has stolen third base 46 times in 49 attempts. And how about the Braves? They’re averaging 4.89 runs per game, fourth in the majors. Last year, they averaged 3.96, the major reason they missed the playoffs . . . Happy birthday, Jeff Bagwell (44) and Mark Clear (56).